Diabetes is a disease in which glucose (sugar) builds up in the blood stream because the body does not produce or properly use insulin. Glucose comes from the food we eat and is needed by our bodies to produce energy. Insulin is made by cells in the pancreas and moves glucose from our bloodstream into our cells. The goal of a person with diabetes should be to lower their blood sugar levels and improve their body’s use of insulin. Diabetes was the seventh-leading cause of death in the United States and Alabama in 2014 and 2015. Prediabetes is a condition in which individuals have blood glucose or A1c levels higher than normal but not high enough to be classified as diabetes. 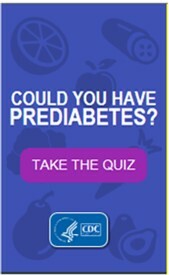 People with prediabetes have an increased risk of developing type 2 diabetes. Attending a structured lifestyle change program can decrease the risk of developing type 2 diabetes for those with prediabetes. Also referred to as Insulin Dependent Diabetes Mellitus (IDDM). 10% of all diabetes cases are type 1. Is a genetic disease or caused by contracting certain viruses. Insulin is produced by cells in the pancreas. In people with type 1, the body does not produce insulin adequately, so they must take daily injections of insulin. Type 1 diabetes usually occurs in children or young adults who are thin or normal weight for height. Also referred to as Non- Insulin Dependent Diabetes Mellitus (NIDDM). 90% of all diabetes cases are type 2. Is not a genetic disorder. People with type 2 diabetes are usually over 45 years old, have a family history of type 2 diabetes, high blood pressure, gestational diabetes (for women who had high blood sugar during pregnancy), and are generally overweight. Occurs most often in Native- Americans, Hispanic/ Latinos, and African- Americans. Only seen in pregnant women with high blood sugar. Have a 50% risk of developing type 2 diabetes later in life. Fasting Glucose – blood glucose level before eating a meal. Hypoglycemia – a lower than normal blood glucose with symptoms but reads 70 to 110 for people with diabetes. Hyperglycemia – a higher than normal blood glucose reading ranging from 140 to 180 one to two hours after a meal for people with diabetes. Gestational Diabetes – a form of diabetes that only affects women during pregnancy. After delivery blood sugars return to normal. Oral Agents – medications that stimulate the pancreas to produce more insulin or enable the body’s cells to use insulin more effectively (ex: Glucophage). Diabetic Ketoacidosis (DKA) is a condition usually seen in patients with type 1 diabetes, occurs when the body has a severe deficiency of insulin. This causes a build up of glucose and acid in the blood which causes the person to become comatose. Symptoms of DKA include abdominal pain, confusion, dehydration, fatigue, and a fruity odor of the breath. Hyperglycemic Hyperosmolar Non-Ketotic Syndrome (HHNS) is a condition characterized by high blood sugar levels (360mOsm/L) with enough insulin present and effective to allow some cellular glucose uptake and metabolism to prevent ketosis. Symptoms of HHNS include thirst, dry mouth, dizziness, and confusion. Retinopathy which can cause poor vision and blindness and other eye conditions, such as cataracts and glaucoma. Exercise five or more times a week for at least 30 minutes a day. Exercise helps to increase insulin’s ability to function correctly. A healthy diet consists of several helpings of fruits and vegetables per day. Consult this vegetable ranking to see which ones pack the highest nutritional punch. Increasing the coverage of lifestyle interventions, e.g. physical activity and pharmacological interventions for diabetes, should be a priority in states with a high diabetes prevalence. Some states also need to improve diagnosis, especially among men, because early diagnosis and intensive glycemic control reduces the future incidence of microvascular complications.